The story of Infinity Foods began in 1970 with the setting up of the world’s first macrobiotic student restaurant, Biting Through, at Sussex University. I had been a student at the University a couple of years before, but it hadn’t worked out for either of us and I did not stay long. I spent as much of the next couple of years as possible travelling and living the hippie life to the full in Moroccan villages in the Ourika valley and outside Essaouira. The idea of simple natural foods, particularly whole grains and vegetables, was in the air at the time, but in the UK at least, until the setting up of Seed restaurant in London by the Sams brothers, natural eating was dominated by the older vegetarian/naturopathy movement. Basic foodstuffs such as brown rice were only found in tiny and expensive packets in health food shops, otherwise dominated by pills, potions and cosmetics. My travelling life came to an end with a bad case of hepatitis, and it was on my sickbed that I became seriously interested in the macrobiotic approach to health and harmony. Apart from hedonism, this was also the first thing for many years that I felt I could pour all my energy into. On my return to England I responded to an ad placed by Sussex University student James (then Jim) King in Ceres Grain Shop in the summer of 1970 looking for partners to open a wholefood restaurant at the University of Sussex, and through that met Ian Loeffler who was similarly inspired and also in possession of a small insurance company cheque following a car accident. Thanks to passionate campaigning, the Students’ Union eventually agreed to let us hire a big basement restaurant, and in 1970 we opened Biting Through. We didn’t know much about cooking – certainly in bulk – but after we’d scrubbed the place clean of accumulated hamburger grease, we started serving brown rice, vegetables, seaweed, unyeasted bread and beans to our undiscriminating customers. Undiscriminating because, blessed with the cast-iron digestions of the young, and with no spare cash, they hoovered up our cheap heavyweight fare by the pot load. As for us, we literally ran for ten hours a day serving up hundreds of meals, assisted by all kinds of volunteers inspired by the idealism (we didn’t believe in profit) and the fun. As time went by, we found more and more people knocking at the kitchen door asking to buy rice, wholewheat flour and muesli, and decided to open a shop. Once again lack of money seemed an insurmountable barrier until the day Andy the Anarchist turned up to do his voluntary vegetable chopping looking glum. His problem was an aunt who had died and left him some money. As Andy didn’t believe in private property, our offer to relieve him of it brought a smile back to his face. But even with this, and loans from various friends and parents, it took a while to find the perfect shop – tiny, hidden away, and very cheap to rent. To start with we had as few as two or three customers a day, and we knew we had to find a way to supplement our microscopic takings. Festival catering was the answer, and starting with the first Glastonbury Festival, and taking in various megarock events on the way, we took our message of cheap, healthy and plentiful food on the road, cooking up vats of lentil soup and rice and turning out meals by the thousand. At this time, although many people came and went, a core partnership was formed by myself, Robin Bines and Jenny Deadman, and this partnership lasted until the founding of Infinity Foods Co-Operative in 1979. In the years that followed, we moved to a larger shop in a better location (Brighton’s famous North Laines, which I think it’s fair to say Infinity helped transform from a run-down low-rent neighbourhood to an exciting creative and sadly now high-rent neighbourhood). We ran a small market garden to feed the shop with organic vegetables, took on the shop next door and turned it into a bakery, and started a natural foods distribution business. Then, from the ruins of a blaze that burned down the warehouse at the back of the shop, we created The Brighton Natural Health Centre (BNHC). This charity took forward the idea of self-health care beyond diet and started to offer classes in a whole range of disciplines – mainly yoga, dance, tai chi and qigong. The BNHC has recently celebrated its 30th birthday and Infinity its 40th. 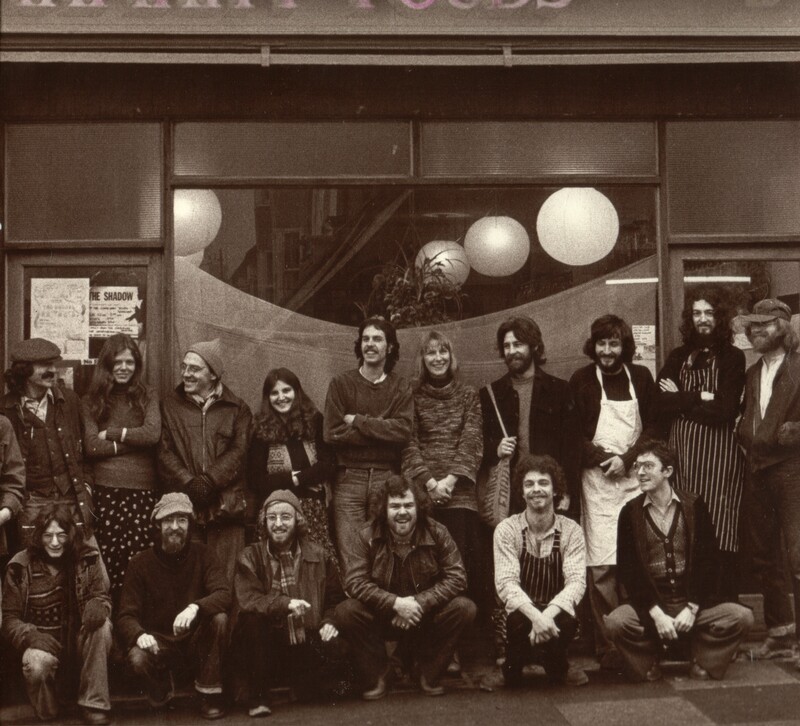 Infinity Foods ran for many years as a loose informal co-operative, with everyone paid the same wage and decisions made by whoever was most committed at the time. However in 1979 we decided to formalise the co-operative and establish it as a legal entity under Industrial Common Ownership rules, and the three partners gave away the business to the co-op. Co-Op status principally means that there is minimal differentiation in salaries, that all workers receive an annual dividend, that a percentage of annual profits is committed to charity, and that it can never be sold to the benefit of its workers (if it were sold, all proceeds would have to be donated to a similar co-operative). Nature’s Foods was written during a happy time when a group of us – mostly working at Infinity – lived together in a large house several miles out of town, cooking and eating great meals together every night. Karen Betteridge, who was also living in the house, was an American visitor who ran a small craft shop in Brighton. We both believed that the macrobiotic approach to natural foods had to root itself in our own (rather than the Japanese) culture. Karen was inspired by the simplicity and self-reliance of the American homesteading life and I was in love with British rural traditions. Between us we wrote this simple cookbook. It is very much of its time and is now mainly a historical curiosity, but I think it retains its charm, not least due to Karen’s hand-written text and illustrations. Although I would not now endorse it all, I think it still conveys a commitment to natural and organic foods as part of a wider ideal of sustainability and food justice. It is no bad thing to be reminded of this at a time when the organic movement risks becoming just another form of consumerism. As the introduction to Nature’s Foods says “We believe in a diet that is simple and harmonious, cheap and wholesome, non-destructive (to other creatures, other men and our planet) and is based on a fair share of what is available”. I recently came across this 1973 document laying out the aims of the nascent Natural Foods Union. It seems like a different time – when idealism and vision seemed normal.